It has been a while and not because I had nothing to write about, but more because I was busy getting Ba-Li Cravings up and running. After 8 month of building my beautiful kitchen, it is time to create delicious food. Catering is amazing. Spending hours in the kitchen slicing and dicing is even more wonderful than I had hoped. I have met truly incredible people who have had events, and I got to be a part of the fun. “Thank you for the amazing and delicious feast! Everyone loved your healthy food! My husband, who is an expert on Babka, says this was the best in his life! We couldn’t stop eating and we almost finished the wonderful Shakshuka and had the oh so tasty moussaka! The tabuleh salad, stuffed grape leaves, hummus and baba ghanoush with the homemade bread was incredible. The chocolate and cinnamon babka, topped with berry mousse was divine! We all went back for second helpings and a few went three times! I cannot thank you enough and we will definitely ask you to cater our future gatherings! A new big fan! Everyone really flipped over how good your food tasted and these young people have traveled and know food. This is why I do what I do. To make people happy and excited about what they eat, and how tasty it is. Introducing new flavors is exciting. Most of all is the excitement of introducing a new way of catering. No more of the same but something completely different. This is not about serving breakfast, lunch or brunch. This is about serving people. It is about making everyone feel welcome and appreciated, about no one feeling left out or that they cannot find what to eat, or need to ask for something they can eat. Food preferences are individual and personal, and it is a challenge to make a spread where everyone feels thought of, and that is what we do. When you work with fresh ingredients, and make everything from scratch, it is easier to make delicious vegan, vegetarian, gluten free, dairy free or carnivore options. I do not have one set menu, or just one option. I tailor the menu for you, your guests and your event. It might require learning new menu items, or names, or an additional email. Our promise is that we will always do our out most to make your event Pure Deliciousness! We are truly doing what we love, and you will feel it when you work with us. I look forward to hearing from you, any thought, question or request. Will you be at the Women in Business Meetup on the Commons May 17th? This looks and sounds delish. Cheers! Yes I will. With a vegan platter and desserts. 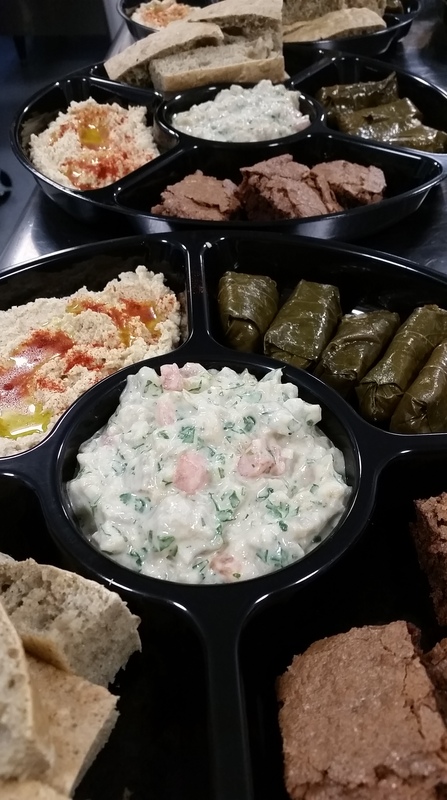 Some Baba Ganoush, hummus, rice filled grape leaves, fresh bread…. all deliciousness…. Introduce yourself Robin…. Thanks!